Background: Increased enthusiasm toward newer fashion trends among rural India along with the lack of government regulation has led to increased tattoo reactions. 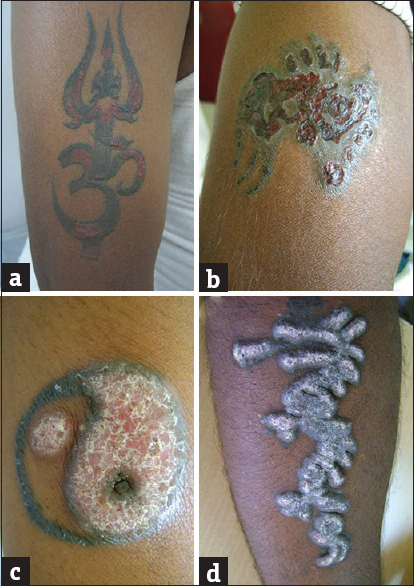 Objective: The objective of this study is to describe various clinical manifestations of hypersensitive reactions to tattoo ink reported at a tertiary care hospital in Mandya district. Materials and Methods: An observational study was carried out over a period of 1 year from June 2014 to May 2015 at Mandya Institute of Medical Sciences, Mandya. All the patients reporting with allergic reaction due to tattooing were included in the present study after obtaining informed consent. Transient acute inflammatory reaction, infections, and skin diseases localized on tattooed area were excluded from this study. A detailed history regarding the onset, duration and color used for tattooing were collected. Cutaneous examination and biopsy was to done to know the type of reaction. Results: Fifty cutaneous allergic reactions were diagnosed among 39 patients. Mean age of subjects was 22 years and mean duration before the appearance of lesion was 7 months. Common colors associated with reactions were red (53.9%), black (33.3%), green (5.1%), and multicolor (7.7%). Itching was the predominant symptom. Skin lesions mainly consisted of lichenoid papules and plaques, eczematous lesions, and verrucous lesions. Lichenoid histopathology reaction was the most common tissue allergic reaction. Conclusion: Increasing popularity of tattooing among young people has predisposed to parallel increase in adverse reactions. Red pigment is most common cause of allergic reaction in the present study, and lichenoid reaction is the most common reaction. Transient acute infammatory reaction at the tattoo site is the most common skin complications. Tattooing is a very old practice which involves insertion of ink pigment of the desired color into the dermis. It is prevailing among most of the societies worldwide and is becoming increasingly common in developing countries. Furthermore, it is becoming more prevalent among rural youngsters of India due to increased enthusiasm toward newer fashion trends. Color mismatch and patient dissatisfaction are common complications when used as a camouflage technique. Furthermore, many regret after tattoo and requests for its removal. Many modalities such as lasers, surgical excision, deep peels, salabrasion, cryotherapy chemical tattoo erasers, topical imiquimod, and magnets have been employed for tattoo removal, but lasers are the gold standard in tattoo removal. Several complications are associated with laser tattoo removal of which immediate complications such as pain, blistering, crusting, and pinpoint hemorrhage are most common. Among the delayed complications, pigmentary changes, hypopigmentation and hyperpigmentation, scarring and textural changes, paradoxical darkening of cosmetic tattoos, residual pigmentation or ghost images and allergic reactions can be seen with laser tattoo removal. Chemical tattoo erasers may be complicated with acid burns, depigmentation, and hypertrophic scar. Allergic reactions to tattoo pigments are uncommon following tattooing because ink pigment gets encapsulated in fibrous tissue and become less reactive histologically. Occasionally, individual may become sensitive to ink pigment or its constituents which may manifest in several ways including allergic contact dermatitis and photoallergic dermatitis. In addition, tattoo ink reactions can be classified as acute inflammatory reactions, allergic hypersensitivities, and granulomatous, lichenoid, and pseudolymphomatous types of reactions. Pruritus, localized edema, and eczematous rash with serous drainage are the common clinical presentation. Rarely, lichenoid or verrucous papules or plaques and exfoliative dermatitis may be seen. Histopathology often shows acanthosis, spongiosis, and a lymphocytic perivascular infiltrate. 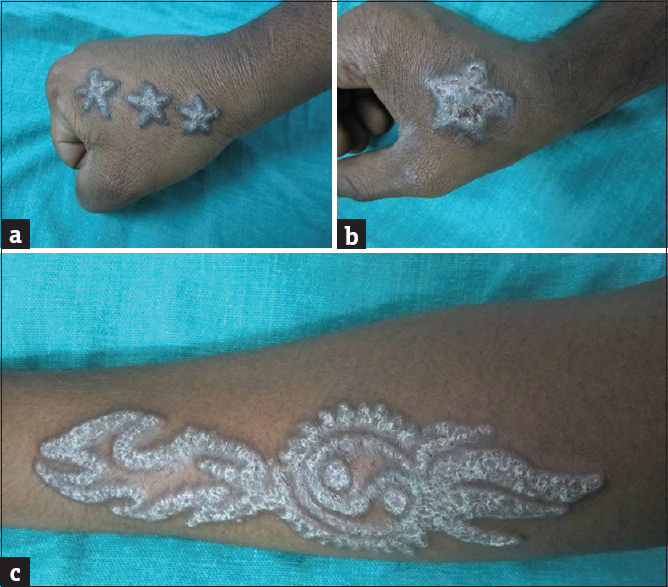 The objective of this study is to describe various clinical manifestations of allergic reactions to tattoo ink reported at a tertiary care hospital in Mandya district. An observational study was carried out over a period of 1 year from June 2014 to May 2015 at Mandya Institute of Medical Sciences, Mandya. All the patients reporting with allergic tattoo reaction due to tattooing were included in the present study after obtaining informed consent. Transient acute inflammatory reaction, infections and skin diseases localized on tattooed area were excluded. A detailed history regarding the onset, duration, and color used for tattooing were collected. 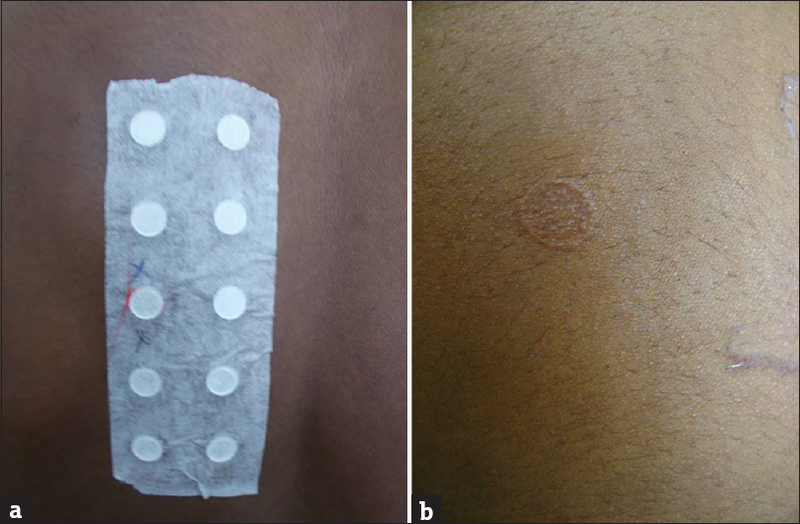 Cutaneous examination was to done to know the type of lesion and 4 mm punch biopsies for histology were obtained to verify chronic inflammation in the lesion and to exclude specific skin diseases localized to tattoo and neoplasia. Fifty cutaneous allergic reactions were diagnosed among 39 patients. Five patients had reactions over more than one site. Mean age of subjects were 22 years (range, 17–29 years). The duration of lesions ranged from 1 month to 3 years with an average duration of 7 months before the appearance of allergic reaction over the tattoo. Only one lesion was seen on the chest but rest all lesions were located on the upper limb [Table 1]. Wrist, forearm, and arms were the preferred locations of tattoo among the subjects. Red color was the common color associated with reaction which was seen among 21 (53.9%) of 39 patients. It manifested as lichenoid papules and plaques [Figure 1]a, ulcerated lesions [Figure 1]b, scaly eczematous plaque [Figure 1]c, and verrucous lesion [Figure 1]d. Allergic reaction to black pigment was the second most common seen in 13 (33.3%) patients [Figure 2]a. Other allergies seen are too green (5.1%) color [Figure 2]b and multicolor (7.7%) [Figure 2]c. Thirty-six patients (92.3%) with reactions were underwent amateur tattooing, and most of them did not know the ink used. However, only three patients with professional tattoo had come with reactions. Two patients revealed that artists used Fevicryl Acrylic Paint ®. Personal or family history of atopy was noted in five patients (2.8%). Majority (71.8%) complained itching as the predominant symptoms. Lichenoid papules and plaques [Figure 3]a were the most common skin lesions in the present study which was seen in twenty lesions (40%) followed by eczematous dermatitis among 12 (24%) which are crusted or chronic lesions with scales [Figure 3]b. Verrucous lesions [Figure 3]c were noted in 9 (18%) subjects and ulcerated plaques [Figure 3]d were noted in 5 (10%) persons. Others lesions were papules and plaques which were seen in four persons. It was interesting to note that following allergy on a new tattoo, concomitant reaction developed in the already existing tattoo among 3 patients. 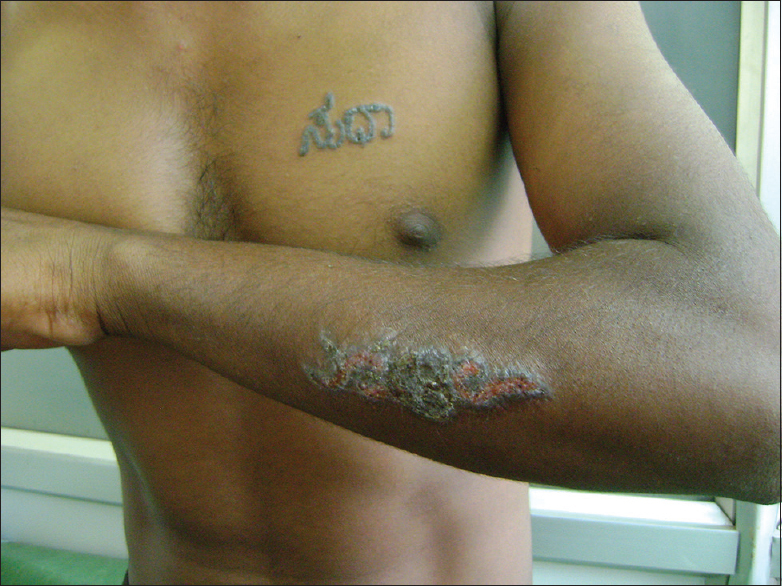 [Figure 4] shows allergy reaction to red color on the left forearm with concomitant reaction over existing black tattoo over chest. This happened mainly among those who developed allergy to red ink. Histopathological examination of thirty lesions was done. Lichenoid reaction [Figure 5]a,[Figure 5]b,[Figure 5]c with hyperkeratosis and parakeratosis with dense lymphocytic infiltration at dermoepidermal junction with pigment incontinence was observed among 16 (53.3%) patients [Table 2]. Other types of reaction noted were eczematous (26.7%) [Figure 6]a and [Figure 6]b, foreign body reaction (10%) [Figure 7]a,[Figure 7]b,[Figure 7]c, palisading granuloma (6.7%) [Figure 8]a,[Figure 8]b,[Figure 8]c, and sarcoidal reaction (3.3%) [Figure 9]a and [Figure 9]b. Periodic acid-Schiff stain, acid fast and Gram stains were negative for organisms. Patch testing with Indian standard series was negative on 10 patients. However, two patients showed a positive response to Fevicryl Acrylic Colors ®, acrylic dye used for painting on fabric, wood, paper, leather, and canvas [Figure 10]. Topical steroid, intralesional steroid, and cryotherapy were considered for the management of thick plaque lesions. Excision and Q-switched neodymium-doped yttrium aluminium garnet laser were considered for removal of tattoo. Although tattoos have been around for millennia, they were more popular and have become a fashion statement in today's world. The United States has witnessed a tattoo renaissance in the past two decades among people of all ages, social classes, and occupations. The USA national prevalence rate of tattooing is 24% in the age group of 18–50 years. A 2012 Harris Interactive online poll indicated that 14% of the USA adults had one or more tattoos in 2008, and this proportion increased to 21% in 2012. The exact prevalence in India is not known, but the same trend is continuing in India in recent days with increased number of people accepting tattooing, so as the risks and complications associated with tattooing. Many studies have reported tattoo complication in 2%–3% which ranges from infections to neoplasia , but a recent study among German-speaking countries have reported it to be 7.3%. Tattooing is increasingly common among adolescents and the prevalence among college students aged 18–25 years is 20%–25%.,,,,,,, In the present study, all were young and most of them were students which explain the popularity among the youngsters of India. There is a heavy trend among youngsters to place tattoos over neck and upper limb that have been deemed in the past as negative areas in terms of employment. In the present study, except for a lesion over the chest, all were present with tattoo reactions over the upper limb but there was no relation with site and increased the frequency of reaction. This shows the increase in general acceptance among youngsters and also in community. Tattooing was associated with many complications ,,, and allergic contact dermatitis due to delayed hypersensitivity reaction to different pigments is the most common complication., Ink used for tattoo differs among each artists and also its composition, exact chemistry of such formulations may be difficult to identify. Most inks consist of almost insoluble pigments dispersed in water plus additives such as formulants, dispersants, and preservatives. Nowadays, organic colorants are increasingly used in tattoo inks. Red (mercury salt), green (dichromate), blue (cobalt), yellow (cadmium) pigments, and black are commonly associated with hypersensitivity reaction. However, contamination of pigments with nickel sulfate or azo dyes and quinacridone may be the culprit. Nearly, 53.9% of our patients had an allergy to red pigment which is similar to many other studies.,, Although reactions to red pigment is the most common, nuances of red such as pink, orange, violet, and Bordeaux are also associated with tattoo reactions. Increased reactions among amateur tattoo, which was done roadside may be because of acrylic paints used by some of the artists. Clinically, red ink allergy presents in various ways. Hypersensitive reaction may involve entire area tattooed with the color, including any other tattoos on the same individual performed with the same red color some time back. In addition, reactions in red tattoos typically appear after weeks to years. Concomitant reactions in older, red-colored tattoos performed with different ink brands may be triggered following new tattoo. Similar findings were seen among four patients in the present study. Histopathology showed lichenoid, eczematous, granulomatous, or pseudolymphomatous reactions which are confined to the areas of the tattoo. Lichenoid tattoo reactions is the most common histopathological pattern associated with delayed-type hypersensitivity reactions to tattoo and commonly associated with red ink.,, In the present study, lichenoid reaction was the most common and followed by eczematous reaction which is similar to studies by others. One report reviewed 18 patients with red tattoo reactions and showed that 13 patients had the histologic pattern of a lichenoid reaction. The granulomatous reaction is a foreign body reaction to the pigment and is associated with the use of mercury, chrome, cobalt and manganese. Pure sarcoidal reactions are rare in tattoos and associated with multicolor tattoo. The present study had a single case of sarcoidal granuloma for multicolor tattoo without systemic involvement. Sarcoidal reaction may be nonspecific finding or a manifestation of systemic sarcoidosis. The management of tattoo reaction is always a challenge. Diagnostic patch testing often shows negative results may be because suitable patch test solutions are difficult to obtain owing to the low dispersing capacities of most pigments. Allergic reactions are treated with topical, intralesional or systemic corticosteroids. Increased popularity and acceptance of tattoo among public has witnessed change in traditionally used dyes and pigments by colorants that have never been used before. This change in trend is coinciding with an increase in reports of adverse reactions. Thus, this swift is posing a challenge for the regulation and risk assessment of tattoo inks worldwide. Every county is formulating guidelines and rules for the use of tattoo dyes but regulation of newer colorants posing a great problem. In Europe Registration, Evaluation, Authorisation and Restriction of Chemicals legislation requires testing for all tattoo chemicals marketed in the European Union. Section 61 and 62 of Federal Food, Drug and Cosmetic Act in the USA regulate tattoo ink selling. New Zealand Environmental Protection Authority have formulated standards for the chemical safety of tattoo inks and also released guidelines, standards, and bylaws to manage tattoo-associated risks. But in India, such regulations are lacking and authorities should draw up strict guidelines and regulations. In addition, there is a need for medical education at college level as there is a need to increase awareness in the youth today regarding increased risks of tattooing when carried out in potential unsterile environments. In addition, tattoo parlors should also be educated about the risks involved and the importance of using proper infection control procedures. Lack of strict regulations by government and increased fashion trends may further increase complications associated with tattoos. Red inks are the most frequently associated with tattoo reactions. 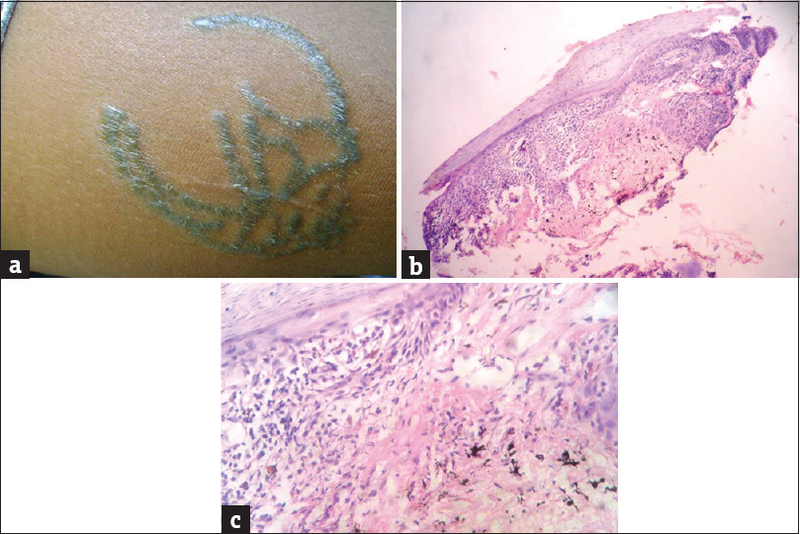 Lichenoid-type reactions are a frequently reported pattern of inflammation seen in tattoo. Dr. Uday Khopkar, Prof. and Head, KEM Hospital and Seth G S Medical College, Mumbai for his help in histopathological guidance. Pesapane F, Nazzaro G, Gianotti R, Coggi A. A short history of tattoo. JAMA Dermatol 2014;150:145. Khunger N, Molpariya A, Khunger A. Complications of tattoos and tattoo removal: Stop and think before you ink. J Cutan Aesthet Surg 2015;8:30-6. Sanghavi SA, Dongre AM, Khopkar US. Tattoo reactions – An epidemic on the surge: A report of 3 cases. Indian J Dermatol Venereol Leprol 2013;79:231-4. Wollina U. Severe adverse events related to tattooing: An retrospective analysis of 11 years. Indian J Dermatol 2012;57:439-43. Wollina U. Nodular skin reactions in eyebrow permanent makeup: Two case reports and an infection by Mycobacterium haemophilum. J Cosmet Dermatol 2011;10:235-9. Jafari S, Buxton JA, Afshar K, Copes R, Baharlou S. Tattooing and risk of hepatitis B: A systematic review and meta-analysis. Can J Public Health 2012;103:207-12. Tohme RA, Holmberg SD. 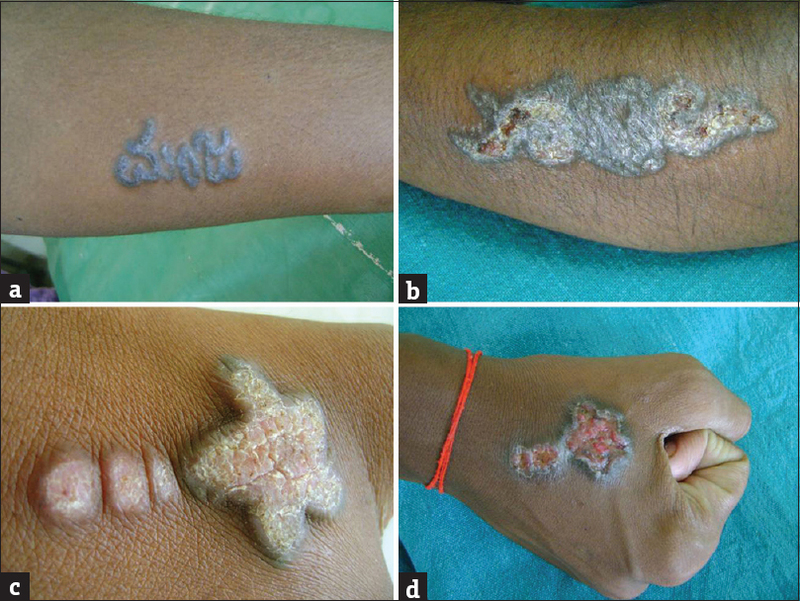 Transmission of hepatitis C virus infection through tattooing and piercing: A critical review. Clin Infect Dis 2012;54:1167-78. Wollina U, De Cuyper C. Evidence-based medicine in laser-assisted tattoo removal. In: Maibach HI, Gorouhi F, editors. Evidence-based Dermatology. 2nd ed. Shelton, CT: PMPH-USA; 2011. p. 557-70. Wollina U. Depigmentation and hypertrophic scars after application of a fluid lactic acid tattoo eraser. Wien Med Wochenschr 2015;165:195-8. Kilmer SL. Laser treatment of tattoos. Dermatol Clin 1997;15:409-17. Kaur RR, Kirby W, Maibach H. Cutaneous allergic reactions to tattoo ink. J Cosmet Dermatol 2009;8:295-300. Laumann AE, Derick AJ. Tattoos and body piercings in the United States: A national data set. J Am Acad Dermatol 2006;55:413-21. Braverman S. One in five U.S. adults now has a tattoo. New York: Harris Interactive; 2012. Urdang M, Mallek JT, Mallon WK. Tattoos and piercings: A review for the emergency physician. West J Emerg Med 2011;12:393-8. Kazandjieva J, Tsankov N. Tattoos: Dermatological complications. Clin Dermatol 2007;25:375-82. Mayers LB, Judelson DA, Moriarty BW, Rundell KW. Prevalence of body art (body piercing and tattooing) in university undergraduates and incidence of medical complications. Mayo Clin Proc 2002;77:29-34. Drews DR, Allison CK, Probst JR. Behavioral and self-concept differences in tattooed and nontattooed college students. Psychol Rep 2000;86:475-81. Forbes GB. College students with tattoos and piercings: Motives, family experiences, personality factors, and perception by others. Psychol Rep 2001;89:774-86. Greif J, Hewitt W, Armstrong ML. Tattooing and body piercing. Body art practices among college students. Clin Nurs Res 1999;8:368-85. Mayers L, Chiffriller S. Sequential survey of body piercing and tattooing prevalence and medical complication incidence among college students. Arch Pediatr Adolesc Med 2007;161:1219-20. Koch JR, Roberts AE, Armstrong ML, Owen DC. Body art, deviance, and American college students. Soc Sci J 2010;106:467. Armstrong ML, Roberts AE, Owen DC, Koch JR. Toward building a composite of college student influences with body art. Issues Compr Pediatr Nurs 2004;27:277-95. King KA, Vidourek RA. Getting inked: Tattoo and risky behavioral involvement among university students. Soc Sci J 2013;50:540. Tang MM, Beltraminelli H, Perruchoud D, Pelivani N, Borradori L, Simon D. A tattoo complicated by allergic contact dermatitis and panniculitis. J Eur Acad Dermatol Venereol 2014;28:127-8. Vilaplana J, Chimenos JM, Fernández AI, Pereira-Veiga N, Romaguera C. Problems in the diagnosis of contact dermatitis by tattooing. Exogenous Dermatol 2002;1:307-12. Mortimer NJ, Chave TA, Johnston GA. Red tattoo reactions. Clin Exp Dermatol 2003;28:508-10. Aberer W, Snauwaert JE, Render UM. Allergic reaction to pigments and metals. In: De Cuyper C, editor. Dermatologic Complications with Body Art: Tattoos, Piercings and Permanent Makeup. 1st ed. Belgium: Springer Link; 2010. p. 66-73. Bhardwaj SS, Brodell RT, Taylor JS. Red tattoo reactions. Contact Dermatitis 2003;48:236-7. Sowden JM, Byrne JP, Smith AG, Hiley C, Suarez V, Wagner B, et al. Red tattoo reactions: X-ray microanalysis and patch-test studies. Br J Dermatol 1991;124:576-80. Chave TA, Mortimer NJ, Johnston GA. Simultaneous pseudolymphomatous and lichenoid tattoo reactions triggered by re-tattooing. Clin Exp Dermatol 2004;29:197-9. Adams DR, Eid MP, Badreschia S, Ammirati CT. Self assestment examination of the American Academy of Dermatology. A violaceus plaque. J Am Acad Dermatol 2006;54:185-7. Laux P, Tralau T, Tentschert J, Blume A, Al Dahouk S, Bäumler W, et al. A medical-toxicological view of tattooing. Lancet 2016;387:395-402. Hypersentivity reactions are increasing due to use newer colorants which have less safety data.